Over the past decade, the number of new home purchase mortgages dramatically decreased. According to Home Mortgage Disclosure Act (HMDA) data, 4.9 million purchase mortgages were originated in 2001, rising to 6.0 million in 2005, then dropping to 2.7 million in 2012 (the latest available data, dark blue line below). The drop constitutes a 44 percent decline from 2001 and a 55 percent decline from 2005’s peak volume. Excluding rental properties, purchase loans declined by an even greater 47 percent. What’s behind the mortgage volume drop? A deeper dive into the numbers explains the decrease (and speaks to the urgency of expanding the credit box). New and existing home sales dropped over the last 11 years, meaning there are fewer purchases that could potentially be financed by a mortgage. Sales volume rose from 6.3 million units to 8.4 million units between 2001 and 2005, then took a steep fall to 5.0 million units by 2012. But this 20 percent decrease accounts for less than half of 2001-2012’s new purchase mortgage decline. An increase in all-cash purchases, a sign of investor activity in the housing market, explains the bulk of the decrease in purchase mortgages. CoreLogic numbers indicate that from 2001 to 2007, the share of cash sales crept from 18 percent up to 23 percent, before soaring to 39 percent in 2012 (see figure below). 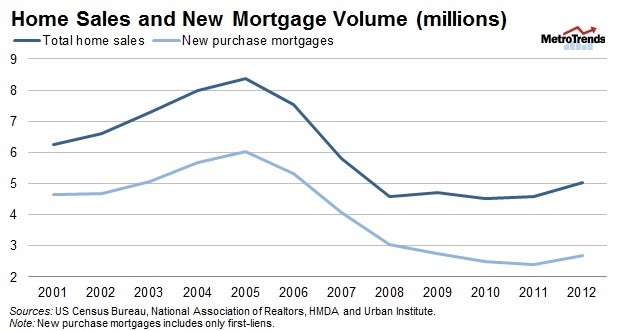 This increase coincides nearly exactly with the decrease in purchase mortgages. Thus, the drop in first-lien mortgage purchases is reflective of the concurrent decline in home sales and increase in the cash-only share. What demographic and economic factors are at play? In 2001-2005, rapidly increasing home prices (See February’s At A Glance, page 17) spurred new home construction and enabled homeowners to “trade up”, while affordability products such as interest-only and neg-am loans enabled some riskier borrowers to purchase first homes. Then, during the recession, high unemployment and house price depreciation contributed to a decrease in household formation and lower homeowner mobility—down from 7.5 percent per year in 2005 to 5 percent in 2012—as borrowers with little or negative equity were locked into their homes, and few found jobs that require them to relocate. Limited credit availability has further compounded the reduction in purchase mortgages. The rise in the cash share reflects a 3 to 5 year credit lock-out for borrowers after experiencing a foreclosure or short sale, and the difficulty for renters and newly formed households to obtain a mortgage. First time homebuyers, many of whom have limited or strained credit histories, now make up only 26 percent of current homeowners, the lowest on record since the series began in 2008. As the figure below depicts, in 2012, low FICO lending was just a fraction of its 2001 market share—dropping from more than 27 percent of new purchases secured with a sub-650 FICO score to less than 7 percent. And because the lack of credit deters current owners from trading up and keeps first-time home-buyers out of the market, many of the 7 million foreclosed homes have fallen into the hands of investors paying cash. If credit were readily accessible, more of these homes would be owner-occupied at an opportune time for these households to build wealth. Will purchase mortgages bounce back anytime soon? Though HMDA data, the most accurate count of mortgages, only exists through 2012, we believe that 2013 will show a small increase in purchase mortgages. Home sales rose from 5.0 million units to 5.5 million units in 2012 and the cash share dropped from 39.5 to 38 percent, reflecting the continuing recovery and lower investor interest as house prices have gained. But will these shifts translate into more first-time homeowners and housing demand? Only if credit-worthy borrowers can actually get loans.